This article is about the Finnish mythical queen. For other uses, see Louhi (disambiguation). Louhi (Finnish pronunciation: [ˈlouɦi]) is a wicked queen of the land known as Pohjola in Finnish and Karelian mythology. As many mythological creatures and objects are easily conflated and separated in Finnish mythology, Louhi is probably an alter-ego of the goddess Loviatar. Louhi is described as a powerful and evil witch queen ruling over the northern realm of Pohjola, with the ability to change shape and weave mighty enchantments. 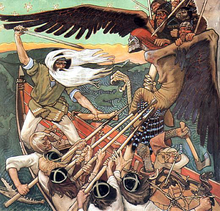 She is also the main opponent of Väinämöinen and his group in the battle for the magical artifact Sampo in the Kalevala. She has a number of beautiful daughters, whom Ilmarinen, Lemminkäinen and other heroes attempt to win in various legends. In true fairy tale form, Louhi sets them difficult to impossible tasks to perform in order to claim such a prize, which leads to the forging of the Sampo. Louhi was the main antagonist in the Finnish-Soviet film Sampo, played by Anna Orochko. There is an orchestral work Louhi by the Finnish composer Kalevi Aho, and the wind orchestral work Louhi's Spells / Louhen loitsut by Finnish composer Tomi Räisänen. Louhi is track 5 on Kesto, recorded by Pan Sonic. Louhi was an inspiration for a foe of Conan the Barbarian's in the Marvel comics version of the character (no such foe ever appears in Howard's stories) and the Final Fantasy: The 4 Heroes of Light boss character Louhi the Witch of the North, as well as the Final Fantasy XI item Louhi's Mask. Louhi is the main antagonist of Michael Scott Rohan's fantasy trilogy The Winter of the World. Louhi is also one of the names of the witch Iggwilv in the Dungeons & Dragons game's Greyhawk campaign by Gary Gygax. In his book Sea of Death, Iggwilv is mentioned as being called Louhi on an alternate Earth. Louhikäärme – Louhi's snake – is an archaic form of lohikäärme meaning dragon in Finnish. ^ Asplund, Anneli; Mettomäki, Sirkka-Liisa. "The Kalevala's Contents". Suomalaisen Kirjallisuuden Seura: Kalevala. The Finnish Literature Society. Archived from the original on 2008-04-22. Retrieved 2008-08-11. ^ "Music Finland Sheet Music Catalogue". Music Finland. Retrieved 2015-06-03. ^ "Louhen loitsut (2012)". Edition TROY. Retrieved 2015-06-03. ^ "Louhi (Hyborian era, Conan foe)". Marvunapp.com. Retrieved 2013-10-06. ^ "Louhi's Mask". FFXIAH.com. Retrieved 2013-10-06. ^ Rohan, Michael Scott (1989). The anvil of ice. New York: Avon Books. ISBN 978-0380705474. ^ Gygax, Gary (1987). Sea of death. New York, NY: Ace Books. ISBN 978-0441756766. This page was last edited on 2 January 2019, at 11:47 (UTC).